U.S. Army Corps of Engineers has been killed. Officials and family confirmed Tuesday that James W. "Will" Coker was killed. An official who spoke with The Associated Press on condition of anonymity said Coker was kidnapped from a power plant where he was working and later strangled. Carrie Hughes described her father as a wonderful man who was deeply religious and loved to travel. She said he had been on several mission trips to Africa with local church groups and had been in Afghanistan for about three months. 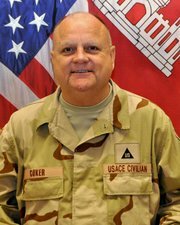 Coker was due back in South Carolina later this month and the family had been planning a get-together to welcome him back. Ben, our prayers are with you and family. I know this loss is wearing hard on you, and I'll stay in touch.